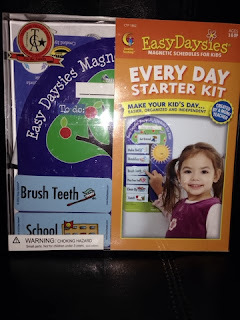 A Special Sparkle: Creative Teaching: Easy Daysies Review and GIVEAWAY!! 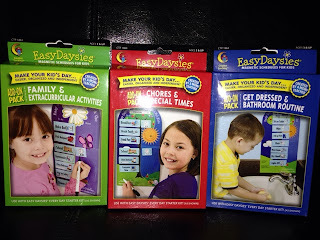 Creative Teaching: Easy Daysies Review and GIVEAWAY!! I was BEYOND thrilled when Creative Teaching Press offered to send me the amazing Easy Daysies magnetic schedules! I was even more excited when they told me we could give one away to one of our readers too!! 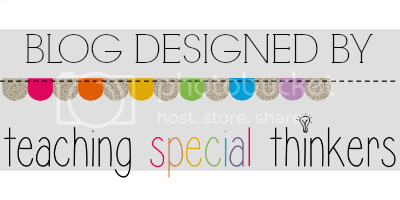 They were already one of my favorite teaching companies, and I was happily surprised when they wanted to me to test out one of their great products. 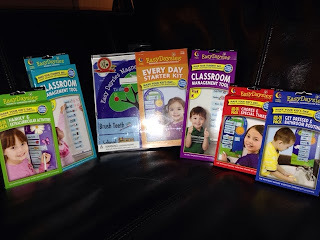 The wonderful people at Creative Teaching Press were kind enough to send me all of the add-on packs, so I can tell you which ones are the best for you based on your needs! This is the item you have a chance to WIN! This is the main kit for the Easy Daysies scheduling products. It is a small board that comes folded in half, but feels very durable. It has two sides so you can choose a happy tree/sun side, or a girly flower depending on the child/class you are using it for. It has a nice little string on the top so you can hang the chart, or you can use the extra large magnet included in the kit to stick the schedule to a magnetic surface. On the left side it says "To Do" and the right side says "Done!" so kids can move the magnets over for each activity when it's finished. The set also includes one blank magnet to write your own activity. It is perfect to use over and over with a dry erase maker. The magnets are all very sturdy, with clear pictures and words for each activity. 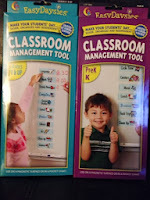 There are 18 different magnets included in the set to arrange on the chart based on your needs. Look at the handy bag the packs come with! There are 3 different add-on packs for the Easy Daysies schedule. These might be my favorite part! The extra sets include so many more activities! The Family & Extracurricular Activities Set is a MUST for the family environment! 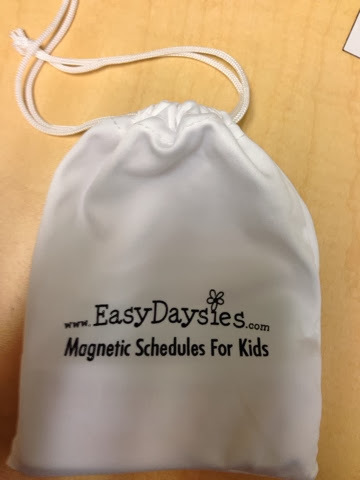 It has all sorts of fun activities many kids participate in such as swimming, play outside, sports, play date, and 3 extra blank magnets for activities not included. 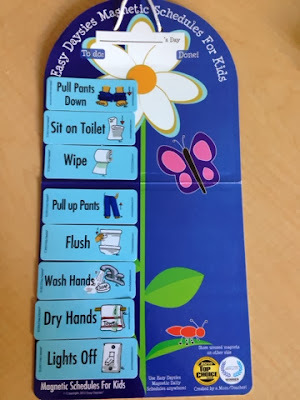 The Chores & Special Times set is wonderful for teaching kids responsibility. 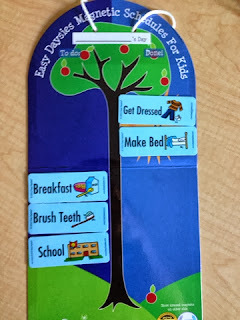 There are little white squares on the magnets so children can use a dry erase marker to check off each day they have done the chore. I especially love that this set include CLOCKS!!! This is great for activities that must occur at a specific time and helps kids read clocks. The Get Dressed & Bathroom Routine pack is perfect for young children as well as moderate/severe classrooms. It includes every detail of the bathroom routine. I was actually quite surprise by just how clear yet tasteful each of the bathroom images were. It can be such a tough topic to talk about and show illustrations in an appropriate way, but this set nailed it! If you are the winner, you can choose 1 classroom pack for your grade level!! These two were my FAVORITE part of the Easy Daysies set!!! 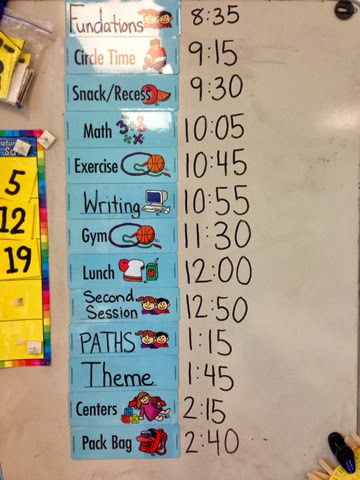 My class has fallen in LOVE with our new schedule! We had a schedule before, but it was small, in a place that was hard to see (due to a lack of wall space), and was inconvenient to adjust each day. The LOVE the Easy Daysies schedule now on our whiteboard at the front of the room. The kids noticed it right away when I put it up! Now they ask us, "Where are we on the schedule now?" or "Let's look at the schedule to see what's next." My kids who get a little homesick also like to see how close we are to going home based on how many of the activities they know we've completed already. I mixed the PreK-K and the 1+ sets together! I like features of both sets such as centers from the PreK pack and Assembly from 1+ pack. Our school has multiple activities with very specific names because it is a special education school. I did not have enough blank magnets with only 1 set! I used the blank magnets from both sets to make my schedule. The set has all of the major subjects, but my school calls things by special names and it would confuse my students to say "science" or "social studies" when they are used to saying "theme" like they are used to. Now it's time for you to WIN!!!!! Winner will be chosen Sunday October 27th, 2013!